Metal group ATHANASIA have released an official music video for their track "Spoils Of War" off of their upcoming album The Order Of The Silver Compass. The music video originally premiered on Revolver Magazine. "Spoils Of War" was directed by Matt Zane and shot in Burbank, California. Watch the video for "Spoils Of War" now on KNAC.COM right HERE. Arena metal trio ATHANASIA has formed out of the ashes of ex-FIVE FINGER DEATH PUNCH guitarist Caleb Andrew Bingham's long time project ASCENSION. 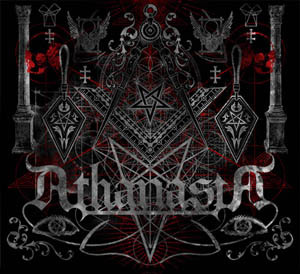 ATHANASIA features Bingham on guitar/vocals, ASCENSION bassist Brandon Miller and MURDER FM and ex-MURDERDOLLS/WEDNESDAY 13 drummer Jason West.